1. Why crocodiles don’t eat hippos? Hippopotamus (Hippopotamus amphibius), or hippo, is a large (very large! ), strong, and aggressive mammal. They are among the largest living land mammals, being only smaller than elephants and some rhinoceroses. Adult hippos average 1,500 kg (3,310 lb) and 1,300 kg (2,870 lb) for males and females respectively. Very large males can reach 2,000 kg (4,410 lb) and exceptional males weighing 2,660 kg (5,860 lb) and 3,200 kg (7,050 lb) have been reported. Despite its stocky shape and short legs, an adult healthy hippopotamus is capable of running 30 km/h (19 mph) over short distances. They have exceptionally big and strong jaws, and large, very sharp teeth. The bite force of an adult female has been measured as 8,100 newtons (1,800 lbf). For a comparison, lions have an average bite force of 1314.7 newtons. Note that it was a female, male hippos are much more powerful, but they are too aggressive to be tested! Hippos have been recorded to break full-grown crocodiles’ backs with a single bite. The skin of a hippo is very thick (around 5 cm or 2 inches) and strong. What’s more, hippos are living in groups of up to thirty animals. A group is called a pod, herd, dale, or bloat. So, crocodiles leave hippos alone. They don’t dare to attack them. They occasionally eat baby hippos, though – but usually, if something’s wrong with the baby (sick, left alone, about to die, etc). Crocodiles know even attacking a baby hippopotamus would bring on the wrath of the adults near it. Crocodiles only feed on hippos which are already dead. The hippopotamus is among the most dangerous animals in the world as it is highly aggressive and unpredictable. Attacking an adult hippopotamus would be unwise for a crocodile. 2. Why do crocodiles cry? Crocodiles really produce tears. Because, while eating, they swallow too much air, which gets in touch with lachrymal glands (glands that produce tears) and forces tears to flow. But it’s not actually crying. The term “Crocodile tears” (and equivalents in many other languages) refers to a false, insincere display of emotion, such as a hypocrite crying fake tears of grief. It is derived from an ancient anecdote that crocodiles weep in order to lure their prey, or that they cry for the victims they are eating, first told in the Bibliotheca by Photios I, who was the Ecumenical Patriarch of Constantinople. This tale was first spread widely in English in the stories of the Travels of Sir John Mandeville in the 14th century and appears in several of William Shakespeare’s plays. 3. Why do crocodiles eat rocks? Crocodiles swallow stones, yes, but they don’t actually eat them. Since they don’t chew their food, many large crocodilians swallow stones, which may act as ballast to balance their bodies or assist in crushing food, similar to grit ingested by birds. 4. Why do crocodiles roll? The “death roll” is probably one of the most well-known and terrifying behaviors of crocodiles. The maneuver involves the croc gripping its prey in its jaws, dragging it into the water, then rotating, using its body weight to turn over and over, still holding the unfortunate creature. Despite its name, the most common use of the death roll isn’t for killing prey but for tearing a piece off small enough to swallow. Since Crocodiles don’t have shearing teeth for cutting prey into pieces, they will grab a limb or another body part of the (usually, but not necessarily, dead) prey animal and then use its tail to rotate its entire body to twist a piece off. Occasionally two or more crocodiles will feed on the same carcass (especially Nile crocodiles) and it’s not unusual for two crocodiles to grab either end and spin in opposite directions, benefiting both crocodiles. 5. Why do crocodiles have scales? Crocodiles are reptiles, and one of the characteristic features of the reptiles is that their bodies are covered with scales. Reptiles have had scales for millions of years as proved by fossils found all over the world. The scales of a reptile are similar to a human fingernail, they are made of alpha and beta keratin. When compared to human skin, the skin of a reptile is thin and fragile, unlike the skin of mammals which offers a thick, leathery dermal layer that offers protection. A reptile’s scales protect the animals from abrasions as they scurry across the ground, or briefly dive beneath the surface of the water. The scales also help protect reptiles from the loss of body moisture which helps them stay healthy. Crocodiles and alligators have rather different scales from those of other reptiles, called “scutes”. The scutes are particularly massive on the back, perhaps because this is the area most exposed to the sun and most at risk of drying out. A saltwater crocodile (Crocodylus porosus). Crocodiles and alligators have rather different scales from those of other reptiles, called “scutes”. 6. Why do crocodiles sleep with their mouths open? Crocodiles do not have sweat glands and release heat through their mouths. They often sleep with their mouths open and even may pant like a dog. 7. Why do crocodiles attack humans? Crocodiles do not necessarily set out to hunt humans. They are opportunistic predators. So, when native large crocodilians and humans live close to each other, crocodile attacks on humans occasionally occur. In fact, crocodile attacks are far more common than shark attacks and yet do not receive as much media coverage. 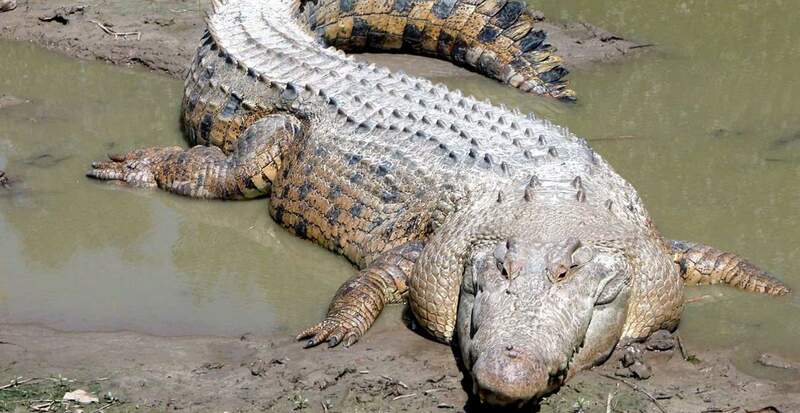 Only 6 out of 22 crocodilian species are considered dangerous to adult humans, and in those six species, only individuals 2 meters (6.6 feet) and longer in length are capable of killing adult humans. Two species, which are also the largest and most aggressive, saltwater crocodile and Nile crocodile have a well-known reputation for preying on humans. These two also have the most documented cases. Each year, hundreds of people die of either Nile or saltwater crocodile attacks. To improve our understanding of human-crocodile conflict (HCC), a database launched in December 13. The Worldwide Crocodilian Attack Database, “CrocBITE“. 8. Why crocodiles are not amphibians? Crocodiles are reptiles, not amphibians, for several reasons. First, they lay their eggs on the land, not in the water. The eggs then hatch into a small but fully formed crocodile, whereas amphibians go through a larval stage (mothers carry their babies to the water in their mouth). Finally, at all stages the crocodiles require air to breathe, using lungs, whereas amphibians breathe through their skin as well as lungs (and some species do not have lungs at all). 9. Why do crocodiles live in water? Crocodiles spend part of their time in water and part on land. Although the saltwater crocodile and the American crocodile are able to swim out to sea, no living species of crocodilian can be considered truly marine. They live in water to hide from predators and to find food sources. They have webbed feet which, though not used to propel them through the water (they tuck their feet to the side while swimming and use the power of their tails), allow them to make fast turns and sudden moves in the water or initiate swimming. Crocodiles also have a valve at the back of their throat allowing them to open their jaw underwater. These adaptations give a great advantage to them while hunting. 10. Why are crocodiles endangered? Today, many species are at the risk of extinction, some being classified as critically endangered. In many countries, their habitat is being destroyed e.g. draining of swamps for agriculture. Many are hunted for food, sport or for their skins. Water pollution is also another problem. Critically endangered crocodile species are: Orinoco crocodile (Colombia and Venezuela), Philippine crocodile (endemic to the Philippines), Cuban crocodile (found only in the Zapata Swamp and Isle of Youth of Cuba), and Siamese crocodile (listed as Critically Endangered, but might be already extinct in the wild; status is unknown).